Yoga Ed is a nationally recognized award winning educational program that is currently benefiting children and teachers in many schools around the country. It is the only program that meets all National PE standards, and is easily implemented in classroom settings as well as in after school programs. Jill Rapperport is one of a select few trainers in the United States. She brings a wealth of knowledge and experience in business and healing modalities to her Yoga Ed trainings. Jill is an experienced Yoga Instructor, a shaman, an accomplished publishing executive and a spiritual life coach. 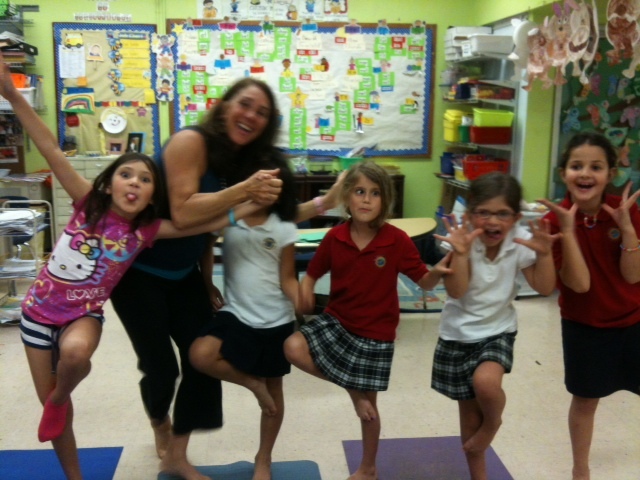 She has launched several successful programs in public and private Miami-Dade County Schools, created and directed Yoga Camps for Preschool through High School for six years. Her work with children has been featured in the Miami Herald, on NPR, and Channel 33. She includes a free coaching session for anyone who wants to develop and grow their business as part of their Yoga Ed training. She is committed to bringing the health and wellness benefits of yoga-based education to children, parents and teachers. She is inspired to assist Yoga Instructors to bring the gift of yoga benefits to children and schools. She can guide you and coach you to express your essence and build your business. All Yoga Ed Trainings are counted as continuing education for both the Yoga Alliance and Professional Development for teachers. The K-8 training is comprehensive for all ages from Kindergarten through 8th grade. 40 hour training includes: 36 week curriculum with lesson plans for all the age groups, Tools for Teachers Manual, Tools for Teachers Training Handbook, Yoga Ed CD. Qualifies for continuing education. Certified Yoga Instructors or the equivalent experience. Refundable up to two weeks before trainining. Register by August 15, and receive a $108 discount!